A good friend of mine in Asia recently asked what kind of books I would recommend for Public Relations Strategy. After reeling off the usual suspects of “Effective Public Relations” by Cultip & Centers and “Crisis Response” by Jack Gottschalk, he responded asking for more. That is when the fun started and the idea for a quick blog started (all of these books and other great reads can be found on my Pinterest page! “Execution” by Larry Bossidy and Ram Charan. It tends to focus more on management (which I find is a key part of PR strategy). “Top Dog” by J. David Pincus. This was recommended to me by a friend at a PRSA International Conference more than a decade ago. It discusses corporate strategy and how communications (internal and external) play into business success. “When Growth Stalls” by a personal friend Steve McKee. It focuses on a good mix of business and communication strategy. A similar read but on the social media strategy front is the “Now Revolution” by Jay Baer. Another great read is “The Tipping Point” by Malcolm Gladwell. This is the book that has celebrated Mavens and other cool terms. 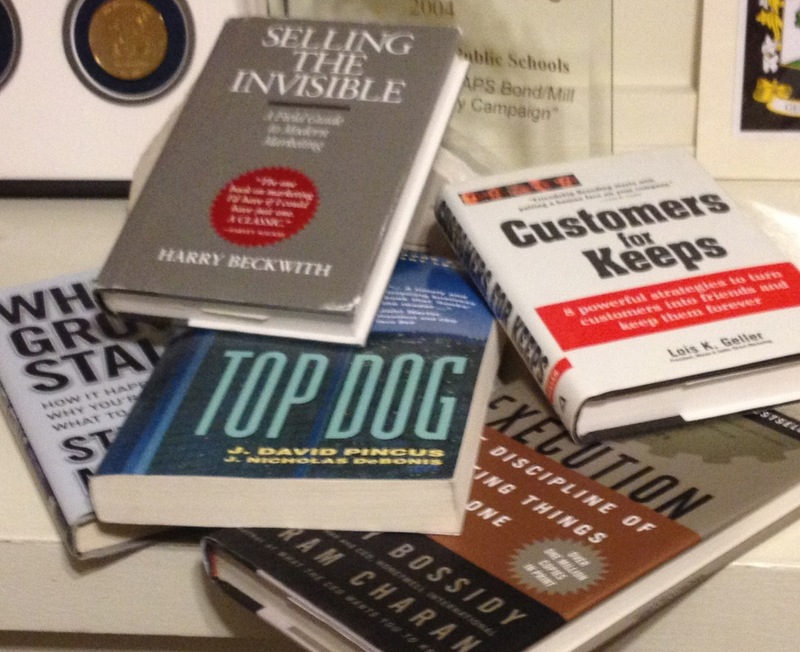 Two really quick reads (if you only have three to five minutes), “Customers for Keeps” by Lois Geller and “Selling The Invisible” by Harry Beckwith. Excellent books. Finally, one that I bought on a trip to Nordstroms in California is by the founder of TOMS shoes Blake Mycoskie “Start Something That Matters”. It addresses a new way to look at Corporate Social Responsibility. Of course there are many many many others. What are some of your favorites? Great list! I second Execution and When Growth Stalls. You forgot The Blue Ocean Strategy! Maybe not as it applies to PR, but definitely for business. I recommend Blink by Malcom Gladwell as well, because so much of PR relies on intuition. The Thank You Economy is also a great book. It focuses on how customer service is THE PR tactic in this age, and talks about how it should be integrated into social media. If you haven’t read Rework you should. The War of Art is also a great read for anyone in a creative industry. It’s similar to Execution in the sense that it’s all about fighting resistance to get things done. I also think there’s a lot one can learn about PR from chick-lit novels, like, Everyone Worth Knowing and Spin. But, mostly those are case studies of what NOT to do. But entertaining nonetheless. At least if you’re a woman in her twenties with an affinity for outrageously priced shoes. Thanks Amanda. I have some of those others I don’t… good wish list items 🙂 I’ll take your word on the Chick-lit novels.